Hello all! As a newbie to regular nail polish use, I’ve noticed that brands make a huge difference in the quality of your home manicure. I’ve gone through a range of brands from drugstore to high-price options. Today I’d like to share my opinions on the brands I’ve used so far. Read on for more! OPI – This is one of the classics. Everyone has probably seen an OPI bottle somewhere in a beauty stash or in a salon. I know my salon at home always carried OPI and I loved the upscale look of the bottle. This polish is a bit more expensive, being about $10 per bottle. However, there is a lot of product in each bottle and the quality is fantastic. I like how the brush is bigger in OPI polishes and coats my whole nail. Formula X – This is Sephora’s nail polish brand. It is the most expensive nail product I have ever purchased as well. I have to say this brand disappoints me a bit. The color is beautiful and opaque, but I find that Formula X chips much more than my other polishes. Perhaps it works better when combined with it’s own top and base coats but regardless I was a bit annoyed with the chipping. Revlon Colorstay Gel Envy – This brand has some of the most high quality polishes I have ever tried. They go on smoothly and the color is opaque.The only problem might be the brush, which is rather big and sometimes unwieldy. This is one of the cheapest brands I have, so I would highly recommend it. Sally Hansen Insta-Dri – Sally Hansen is one of the most affordable nail polish brands out there and it’s great for people on a budget. The color payoff on these quick dry polishes is great with one coat but the brush is pretty huge. It also chips quickly so beware if you don’t use a top coat. Essie – Essie is a new favorite of mine because their color selection is off the charts. Their seasonal collections are diverse and interesting too. Essie makes sheer polishes that are to die for and really perfect the neutral nail. They do take more coats to become opaque, but if you can swallow the $9 price tag, they are worth your while. There you have it my friends! 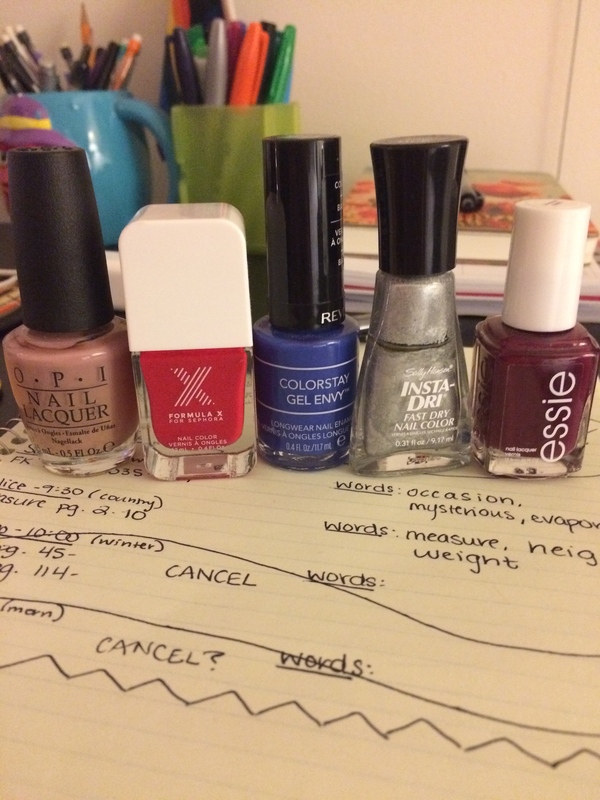 My newbie guide to nail polish brands. Comment with your favorite brand below, and don’t forget to follow me on social media! This entry was posted in Collections, Nails and tagged Essie, formula x, OPI, Revlon Colorstay Gel Envy, sally hansen. Bookmark the permalink. I also love Essie for its colour selection! They have such a huge range and they constantly come out with great colours – there’s AT LEAST one colour in every collection that comes out that I always NEED to have! I am the same way! I just got Bell Bottom Blues from the fall collection. It is to die for! That and frock n’ roll are the ones I’ve been eyeing! Have you tried Sally Hanson’s miracle gel polish? I been using that and curious about your opinion. Hmm I haven’t but now I might! I know Molly uses it and likes it! I love that O.P.I. color, it’s so good for a all seasons! Great post 🙂 I have some fall favorites posted as well- feel free to check it out! I agree, that color is to die for! I’ll check out your post for sure!